We provide a suitable package for all the firefighting water storage tanks, along with all requirements including pumps, shed, control systems and more. Tanks have 20m3 to 200m3 capacity. Used in buildings such as hotels, schools and pre-schools, health centres, primary care centres and other public buildings, fire fighting tanks are used to hold the water needed for extinguishing fires. Also known as Fire Water Storage Tanks they are the perfect solution when a mains water supply is not available, eg in a rural location or private grounds. Concrete is non-combustible and therefore the perfect material to house water for fighting fires. The tank is designed to suit specific requirements for public buildings. We supply both underground and overground water storage tanks, designed to suit you or your clients building. 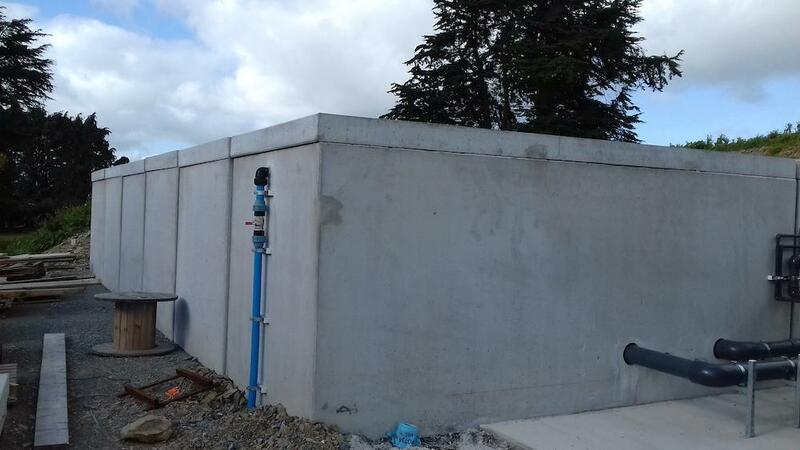 If you are an architect, firefighting consultant, main contractor, quantity surveyor or job estimator, please get in touch with us here at O’Reilly Oakstown, where we will produce the water storage tank you need. Our tanks are fully tested for water tightness and manufacturer requirements and we can provide leak test certification on request.